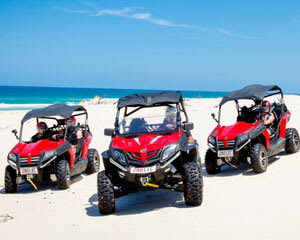 A Gold Coast Island Adventure with Dune Buggies, Segways with a cruise thrown in for good measure! Island Paradises at Adrenaline aren't all coconuts and hammocks, we prefer Dune Buggies, Segways with a cruise thrown in for good measure! This epic Half Day Island Adventure starts with a cruise from Mariners Cove to Stradbroke Island where the fun really begins with a tour of the bush on an Off Road Segway! Then it's time to up the Adrenalin levels with the Dune Buggy Adventure, these two seater ATVs are fully automatic and 4x4 so great fun and easy to drive. You can go as a driver plus passenger or share the driving. Then it's back to Couran Cove where you will have time to cool off with a swim or a drink from the bar before your return cruise to Mariners Cove. Please note this package is based on two people sharing one Dune Buggy, if you would like your own Dune Buggy please click here. The Island Tour was absolutely fantastic and will be taking others to do it. Can't recommend them highly enough. We all had such a wonderful day! I totally enjoyed our experience and everything matched the brochure. Professionally family run, Buggy's match the pictures. I have already put three people onto this activity from FB pictures. The Stradbroke Idland Buggy tour was so much fun. Definitely value for money. I will be recommending it to family and friends. They were amazing people and we enjoyed our trip . Great day out and very well run. Absolutely brilliant day and a great way to discover South Stradbroke Island. Hamish was a fantastic tour guide who provided a great commentary whilst exploring in the buggies. Highly recommended! Brilliant day. Would highly recommend to anyone this adventure.